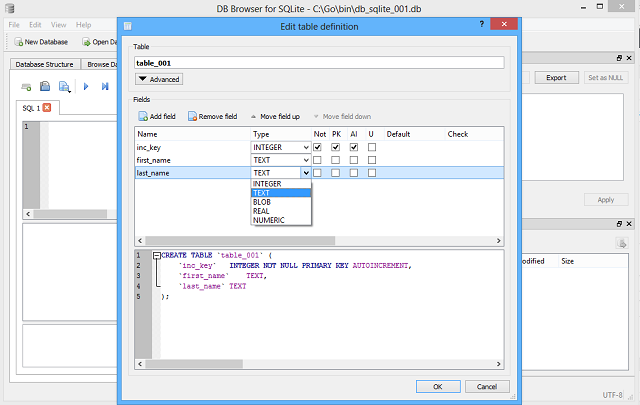 The DB Browser for SQLite tool . You can read more about this on the official website. You can use this application with Windows, MacOS X / macOS , Linux (Arch Linux, Fedora, Debian) or portable. Is not a visual shell for the sqlite command line tool. About sqlite_sequence they tell us: SQLite keeps track of the largest ROWID using an internal table named “sqlite_sequence”. The sqlite_sequence table is created and initialized automatically whenever a normal table that contains an AUTOINCREMENT column is created. The content of the sqlite_sequence table can be modified using ordinary UPDATE, INSERT, and DELETE statements. But making modifications to this table will likely perturb the AUTOINCREMENT key generation algorithm. Make sure you know what you are doing before you undertake such changes. The sqlite_sequence table does not track ROWID changes associated with UPDATE statement, only INSERT statements.